President of Ukraine Petro Poroshenko informed, that Ukraine’s Foreign Ministry will nominate Jamala for UNICEF Goodwill Ambassador, reports press service of the President. “It’s hard to find a more worthy person”, - Poroshenko said. President noted, that this will encourage solution of burning issues like de-occupation of Crimea: “This will stimulate solution of issues regarding children and migration, on the one hand. On the other hand, this will help solve the problem of Russian occupied Crimea and return the entire nation of Crimean Tatars home. What’s even more important, is that it’s happening on the eve of 72nd anniversary of deportation of Crimean Tatar people back in 1944. All this is very symbolic”. 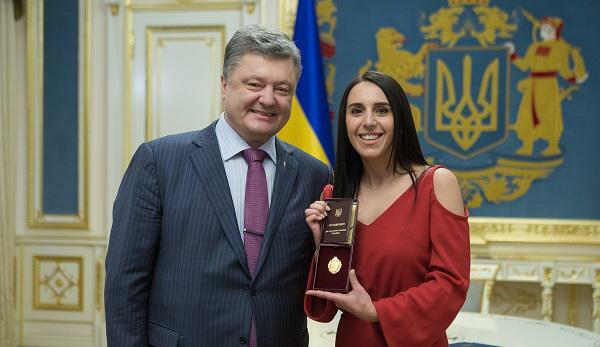 Earlier, Ukrainian singer Jamala won “Eurovision 2016”. Representative from Australia Dami Im came second. Sergei Lazarev from Russia ranks third. Ukraine received 534 points – 211 from juries and 323 in the televoting. Jamala performed with her song “1944” about the destiny of Crimean Tatars.